Sometimes I blurt out random facts to astonished people. (We'll pretend their astonishment is at the sheer amount of bizarre but fascinating knowledge I have rather than at my complete social awkwardness.) I don't know why I retain these random facts but they cheerfully take up something like 90% of my available brain space. I am rather addicted to them and to the books that contain them so when I saw this appealing little book at the cash wrap at the bookstore, it was a foregone conclusion that I'd pick it up and take it home with me. This is very much a gift book. 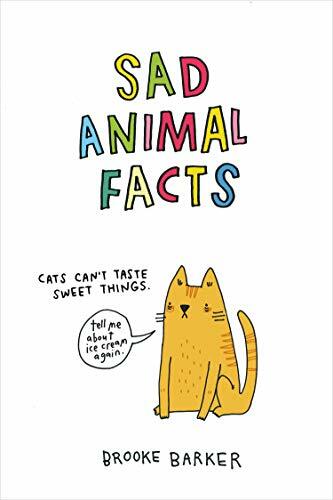 Each page has a brightly colored, basic, hand drawn cartoons of an animal sharing something unknown about its species. Sometimes the fact is sad (if we anthropomorphize) but sometimes its just a fascinating little tidbit about one of the critters with whom we share this planet. Each of the facts is scientifically proven, which will leaving you wondering why science tested certain things in the first place (why did we need to know herrings communicate through farting, that turtles breathe through their butts, that squirrels can't burp, or that dwarf lemurs line their homes with feces? ), and the alphabetical index in the back of the book offers more information on each fact. Lest you think there are only gross 12 year old boy type facts in the book (although don't pretend you didn't enjoy reading them just now and aren't going to use them at your next company party because you definitely are), there are also facts about sleeping habits, eating habits, species empathy, and more as well. The illustrations are cute, the facts Barker has chosen to illustrate are interesting (and only a few of them are common knowledge), and the book is a delightful little book to dip in and out of. As a side note, it is also very appealingly constructed, with smooth glossy pages and a heavy feel in your hands. Highly recommended if you too need new gems for your small talk repertoire.